There are many reasons people shave their heads. A head shave can seem drastic, but for many people it is a personal choice that is easy to make. Some of the most common reasons that people - usually men - shave their heads include: a way to deal with hair loss or male pattern baldness, the desire to make a fashion statement, the wish for a new and different hairstyle, the need to show dedication to a religion or a belief, the way to deal with an overall dislike of hair, or the hope to shock someone. Anyone thinking about shaving their head should know that by following a few simple steps, the process can be very easy and completely pain free. It's very difficult to shave a head that has much hair on it, so it's essential that the hair be cut as short as possible prior to shaving. 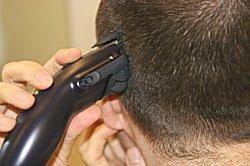 Cutting can easily be done at home, and clippers are a great way to shorten hair quickly for a clean shave. Drenching the hair as well as the head prior to the shave is necessary. This will help prevent razor burn. Appling shaving oil, gel, or shaving cream to the entire area that will be shaved will help prevent cuts and irritation. Going slowly and carefully, trying not to re-shave the same spot(s) more than one time is a good idea. Because it takes practice to get a head shave right, it may take one or two times before it looks completely perfect. Putting on some after-shave or lotion may help soothe the newly-shaved head. If these tips are followed, it's very unlikely that the head shave will look anything but great. Short hair is the first step. When the head is bald, there is no hair that must be washed, conditioned, brushed, or styled. Upon waking up in the morning, there is no hair sticking up on its ends. It draws attention from strangers. 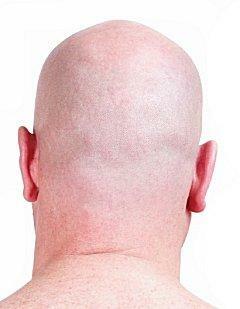 Even though some may view this as a disadvantage, it can be fun to make others wonder why the head is bald. Having no hair is extremely easy and carefree. Wearing a hat or hood when it is cold outside is always a necessity. It's very easy to get sunburned on a bald head. It's essential to always wear a head covering and lots of sunscreen if a lot of time is going to be spent outdoors. Strangers will stare at the baldness and may even ask about it. Many will ask rude or personal questions, so a sense of humor about the baldness is necessary at all times. Most heads are not perfectly round, and most contain some strange looking bumps that are made more obvious when there is no hair to cover them. A common question that people who are thinking of shaving their heads often ask is, "Does it need to be shaved every day?" The answer is, "There is no definite answer. "For a person who wants their head to be perfectly hairless, smooth and shiny every single day, the head will have to be shaved daily. However, many people who don this type of style only shave every two or three days. Shaving on a daily basis increases the chances of obtaining razor burn or ingrown hairs. However, it may be worth the risk because skipping a day or more may allow stubble to start showing. Many celebrities opt for shaved heads for many of the above reasons. Basketball players and other athletes choose to shave for convenience and to avoid excessive sweat when working out. Some actors prefer a shaved head for the same reasons, while still other celebrities may shave their heads for specific movie roles. In February 2007, singer Britney Spears shocked many fans by shaving her head in a stunt that many people believe to be a sign of stress. Regardless of why you choose to shave your head, there are many ways to do so attractively and the benefits of a head shave frequently outweigh the hassle of keeping up an elaborate style.